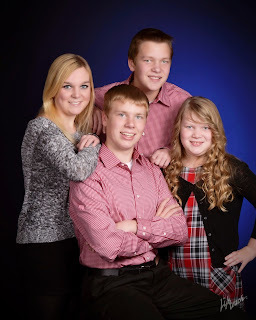 Here we are on the cusp of a New Year and I can say that myself and my family have been sincerely blessed. There has been "issues" along the road of life, but that is just the seasoning that is added along the path that makes us who and what we are. Forged in fire and strong as steal! I've gotten very lovely, most sincere letters, cards and e-mails over the past year from many of you and I want to thank you from the bottom of my heart! You do not know how much joy each word, each kindness that has been shown to me and mine brings to me. Thank you! stitched and finished or framed - 58 items...down from 65 items in 2013. I am honored that Diane and Nikki entrust me with their beautiful designs and allow me to bring them to life. Thank you to you both! 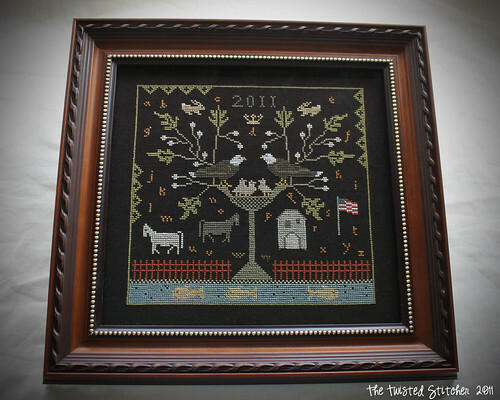 in my 2013 year end review, that I really only had one cross-stitching goal and that was to work toward a Prairie Schooler tree. Well, I met that goal! Of course it is a work in process as is everything in life. Continue to work on my health, by daily exercise and dieting. I have started a prayer journal, as I spoke about in my previous post. I want to work on a closer relationship with my God. I want to work on me spiritually. And as I asked before, if you have a special prayer request, please e-mail me privately (my e-mail address is under the picture of a mailbox in the sidebar) and I will write the name(s) and intentions in my journal and pray every day for the answer that God will provide. Miracles are worked every day through prayers. Ask and you shall receive, knock and it shall be opened. I want to become a better "pray-er" in 2014. I've had a tremendous response from my previous posting, but I know there are still souls out there that need prayer, that are thirsting for answers. E-mail me and get those intentions in my journal and help me in my spiritual journey by helping you. I have one more thing to share with you. I've been asked on multiple occasions how do I cross stitch, so I made a quick video on my technique that I have developed over the years. 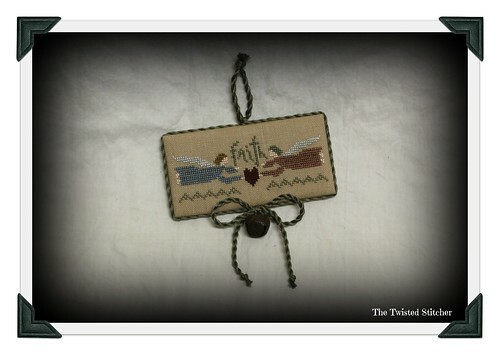 I stitch using the Needlework System 4. I have the floor stand, the lap stand and two Q-snap heads. I have stitched using these products for many years (since 2007). So I stitched two handed and I never turn my needle, therefore the floss does not twist. If I am stitching something for judging, I will use a laying tool, but most of the time I stitch just as I show on this video. That does it for 2014!! May 2015 bring us all what we dream and aspire to! what happened to December? My heavens to mercy...that went FAST! 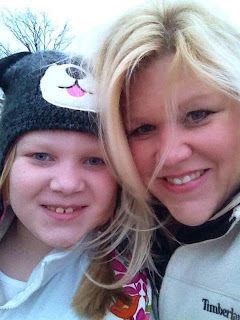 We went through the Easter Seals and Ritzy's Fantasy of Lights in Garvin Park in Evansville, Indiana. Garvin Park is right by Bossy Field which (as a little "side" note) was one of the fields that they shot in the movie "A League of Their Own". In fact all of the fields featured in the movie was from the area that I grew up in. I even saw Madonna the summer they were there. She was quoted saying that the Evansville area was worse than Russia because at that time (early 90's) only the city areas had cable television and where she was staying (in an older farm house in the country near Darmstadt, Indiana) did not have cable and she couldn't watch MTV. 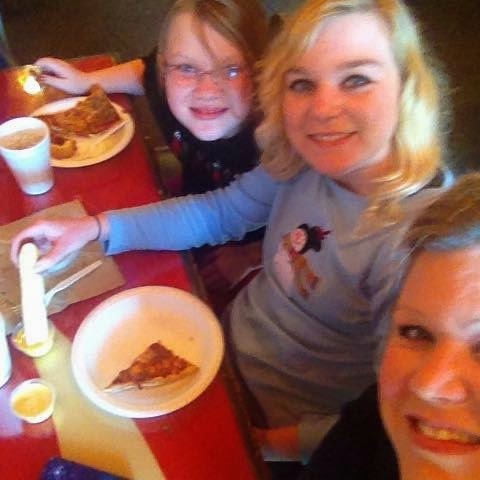 We also hit "Sandy's Pizza" in Fort Branch, Indiana for our once a year "Pizza Extravaganza". Sandy's has a lunch "all U can eat" buffet and believe me...well you just feel like "ugh" afterward...But a well worth it "ugh"!!! 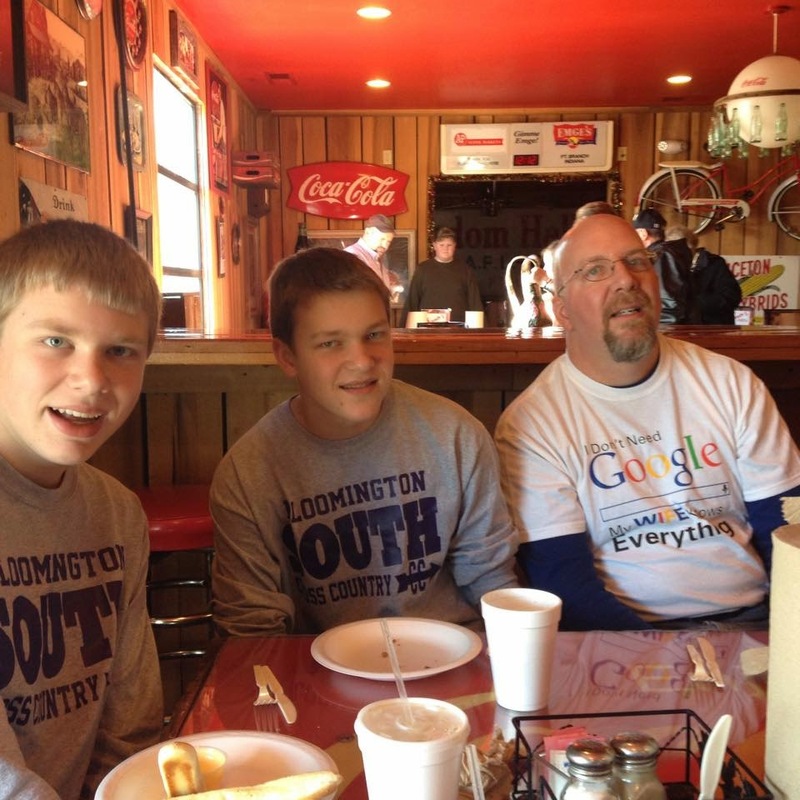 Awww....a great good time, had by all! Thank you to my mother-in-law Bernie for showing us such a great time! She always treats us like royalty when we are staying with her! We took our decorations down early because, Keith will be travelling on business and I have to work all next weekend and I can't lift and carry boxes by myself, so down it came. I love Christmas, but it is always a great feeling to have your house all cleaned and fresh and ready for a "new start" for New Years! 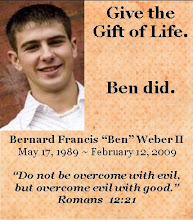 he has had a series of sermons based on "your personal relationship with God". It has made me think deeply about my "personal relationship with God" and know that I need to work on it. I have purchased a prayer journal and plan on writing intentions from my friends in my prayer journal so that I can pray for those in need. Do you have a need for prayer? If so I would like to pray for you and your needs or your family/friends needs, please e-mail me privately (my e-mail is under the picture of the mailbox) and I will add your intention to my prayer journal and remember them in my daily prayers. Of course, it would be private and I would not share anything with anyone. I just want to improve my prayer life and myself and in the process help any that are in need. I'm picking my New Year's Eve cross stitch start...are you?! "Prepare the way for the Lord, make straight your paths for Him.."
Just as God sent the great prophet John the Baptist to make the way for the coming of the Lord, sending him out to urge the people to confess their sins, do penance and be baptized; so have my family and I prepared. Confessing our sins, doing penance, caring for others, praying... turning our minds to what truly matters in life. And today, He, whom we have long awaited has come! and the stoic Jewish man who took his charge from heaven to be the foster father of God the son. Whom angels rejoiced, shepherds watched, nature sang and Kings from the Orient came to admire. The coming of my Lord and Savior, Jesus Christ. Love your neighbor as yourself. Seems so very simple...yet so very hard to truly do. I struggle with this, although I strive, I still struggle, for I am just a poor sinner. I believe that in this world people are thirsting. Thirsting for genuine honesty, hospitality and love. You can find that...if you search within your heart. You can find it. Jesus came to teach us love. Yes, sounds so very simple, yet, so very hard. So very hard to deny ego. To deny self. Love for my neighbor, for those far and wide is what I strive for and will continue to strive for until I am no more. Peace within our heart. Humility. Thankfulness. All of these can be ours because of the one little word: Love. The road is rocky, the road is long, the road is tough. But LOVE is the answer to all our problems. Wouldn't this old,weary world rejoice again, rejoice anew if we but followed His one simple commandment? And because the world needs it I shall pray an old Catholic favorite prayer of mine which invokes the intercession of the Blessed Virgin Mary, that Jewish woman that DID choose love, for it was her choice to make. It was not thrust upon her, it was her choice and she chose it. And He loved her so, His mother, that He listens to her requests in our favor. I fly unto thee, O Virgins of Virgins my mother. despise not my petition but in thy mercy hear and answer me. May the world find love this Christmas day and always. and a hearty thanks to all those that have followed the 25 Days and have written so many wonderful comments or written to me so many wonderful e-mails, notes, cards and have shared my walk awaiting this most holy day! I lit a candle for a friend's friend who is in need, and four little candles on the bottom left hand corner. Do you see them? Three of those were lit in honor of some very dear friends of mine. The fourth candle was lit in honor of all of you, my friends who come here, visit with me, love me for who I am. My prayer for you last evening at Christmas Mass, when I lit these candles, was for us all to Love each other as we love ourselves, as He loves us. With Love on this most blessed day! was asked to play St. Joseph in the Christmas Pageant and Procession prior to Mass. What an honor for him to play the foster father of Jesus. He's not too happy about having to "touch" the actress playing Mary though :) HA HA! He has to "help" her off the donkey and "help" her sit down. Not too much touching to be done :) I told him I thought he could handle it! for the Children's Pageant and also to sing at the Mass. That will be joyful! I love to sing! on the day before the BIG day...I'm sharing with you our Christmas Tree. 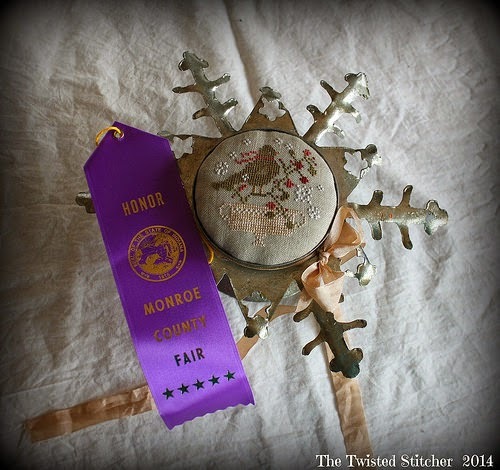 I've been stitching ornaments since I was 15 years old. Most of those, I do not own, as I gave them as gifts to friends and family. 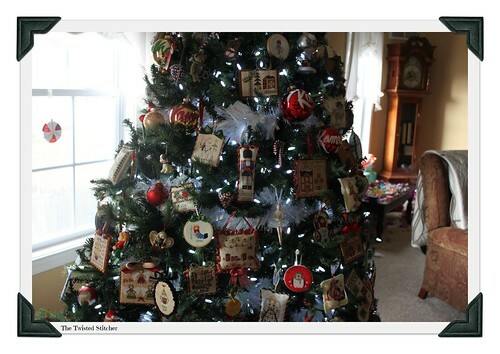 But I started in earnest when Keith and I married and I have in my estimation 200 ornaments on our tree. 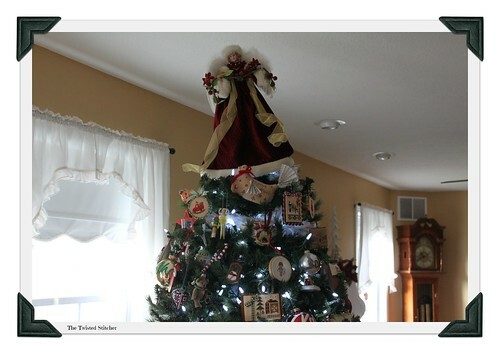 Our tree spins, so it has handmade ornaments 360 degrees around the tree, top to bottom. and that is DAY 24!! 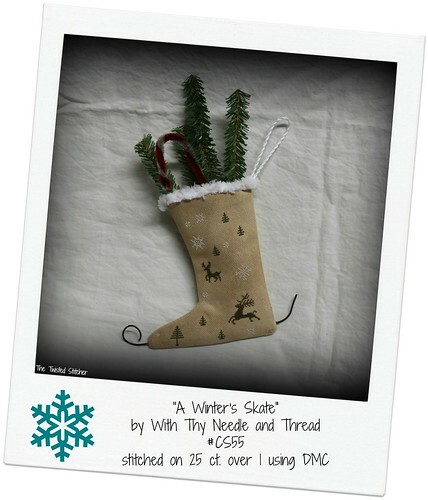 I'll be back tomorrow for the final day of The 25 Days of Christmas with The Twisted Stitcher! I did use the silks called for on the pattern, but obviously the dye lot has changed quite a bit. But no matter...I love it! 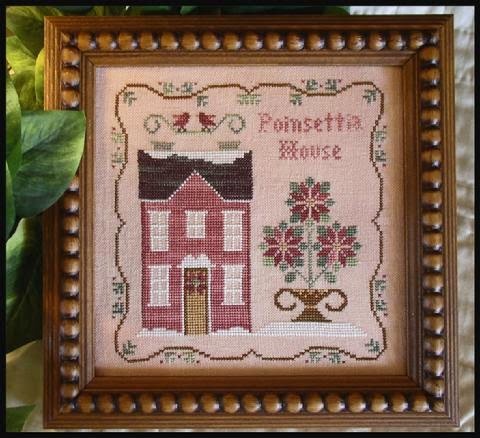 It is finished with Victorian Motto Sampler Shoppe's hand-dyed seam tape in "gingerbread" color. I think it suits perfectly and looks really good on my tree! from my dear, sweetest blogging buddy, Marie P. of Creative Thread; we met on exchange boards about 10 years ago...and we've been buddies ever since ;) Sister's of the heart! Her dear husband took a recent trip to Germany and Marie had him running all over Germany to get gifts and one of them was me! 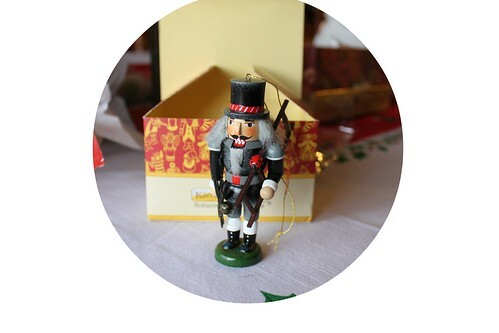 Its a tiny little Nutcracker "good luck" ornament that he picked for me! I cannot tell you how much this meant to me. My husband and I are of German descent...I grew up in a little German Catholic Village here in Indiana named: Haubstadt. I'll be honest, my husband and I are not world travelers. We really aren't even travelers at all. We take our yearly vacation each year and adore it. But honestly, we are happiest being in our own home. There is just so many good things that go on in our home, and it is the hearth and the warmth and the love that makes it ours! Anyhow, this is all to say, I'll never get to Germany in my lifetime, but to know that Marie had her husband pick me up something so meaningful for me...from there...well it had tears in my eyes. 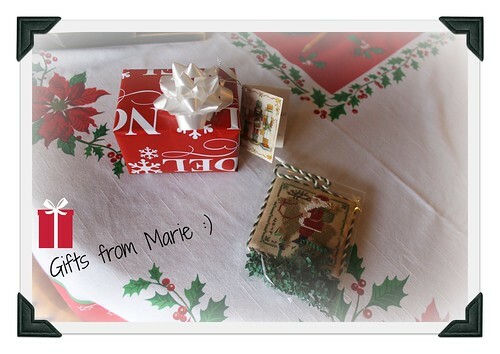 Thank you from the bottom of my heart Marie! 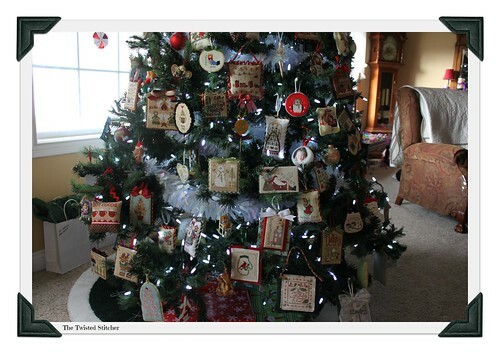 I'll be showing my large tree in many shots to show off handmade ornaments that I have stitched over a lifetime. Its been a lifetime of love and devotion to this most miraculous season! My favorite holiday!! I got called in to work odd shifts again, alone, this weekend. I did my duty to my fellow colleagues and filled in :) Its hard to swing around doing things that you are not familiar with on a schedule that is up in the air all the time. BUT it is a job, and I didn't put myself through 4 years of college to get my BS in Biology and then 1 extra year to get my advanced degree in Medical Technology for nothing. So there you go! You do what you gotta do ;) And I'm thankful for it! 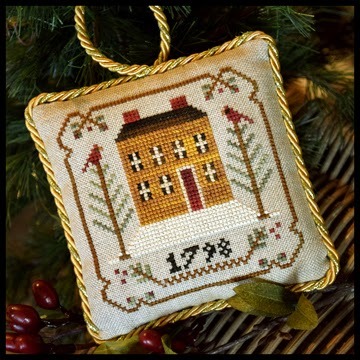 I'm sure are on the automatic shipments (and if you are not, you need to at least be getting these sweet designs) for Country Cottage Needleworks ~ Classic Collection Ornaments. So of course I said, I would be honored to help Nikki out! and let me tell you, I was snow in love after I finished this sweetie. LOVED the polka dotted fabric! and last, but not least because there are 7 more to go!! All of these are just darling! 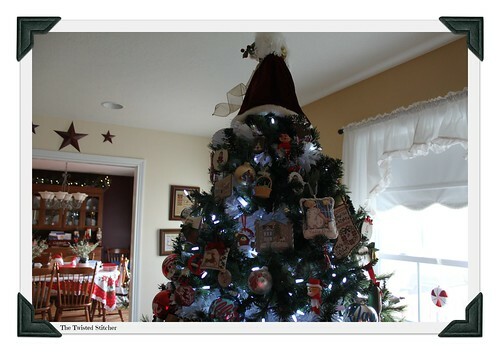 There are many blogs that are devoted to monthly stitching of ornaments through the year. I'm going to really push myself again next year to stitch, stitch, stitch as many Christmas ornaments as I can! These sweeties are NO exception. They are darling on a tree. 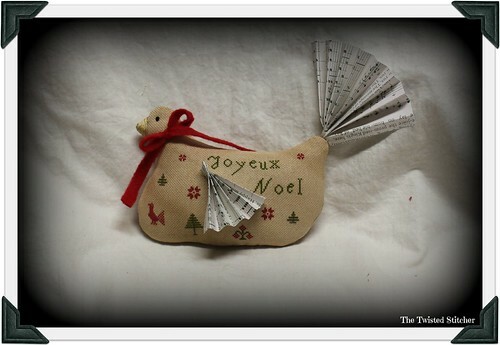 Why don't you join me in stitching ornaments 365 days next year? and Christmas Cookie baking with my kids.... yea! and probably I need to get in a solid 30 on the elliptical....UGH! so that I can eat some cookies...YEA! I am the model stitcher and finisher for this entire series. I've stitched and finished the first four in the series and I have (in my hot little hands) the next 4 designs ready to stitch and finish them. I know there has been much speculation about the series and I can say without a doubt this series is fabulous and will result in 12 gorgeous, sampler inspired ornaments for your very own Sampler Tree! I stitched these on 32 ct. linen that I hand-dyed myself all I did was "pull out" the urn from the original design. When I got these done...well they were just as I envisioned! 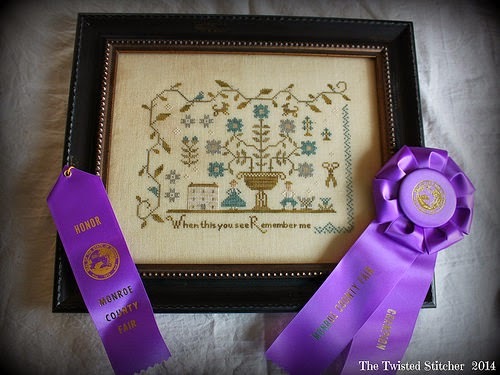 as I was thinking of "The Sampler Tree" of my dreams, it all consists of things like these that I've shown you. 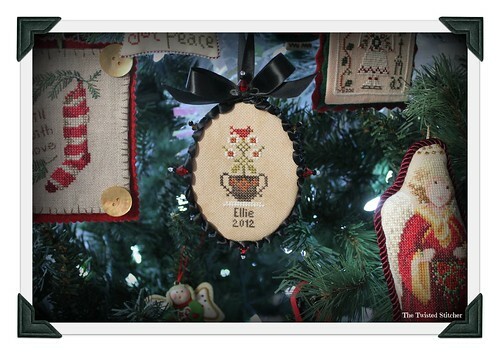 So am I getting all of Diane's new "The Sampler Tree" ornaments to stitch for my own "Sampler Tree"? YOU BETCHA! and then while I wait each month for the next pattern to arrive, I'm going back over all of the patterns I have with a fine tooth comb and pull out "motifs" from them to make for my own "Sampler Tree". 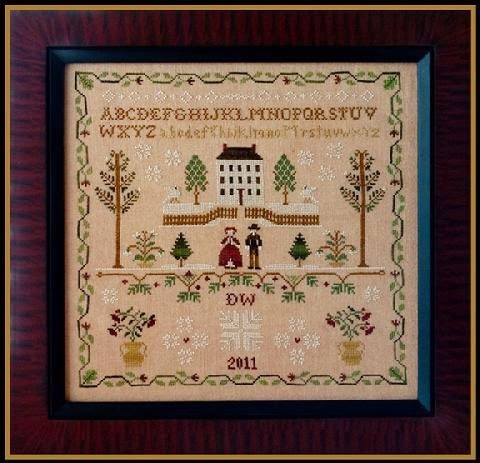 The whole top half of the sampler: large trees on either side, house, man, woman, etc. 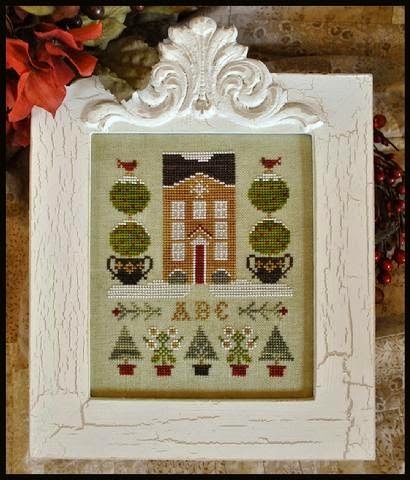 **The border can be stitched around some of these ornaments too, to give the "sampler feel" to all of them, or left off completely. See folks! 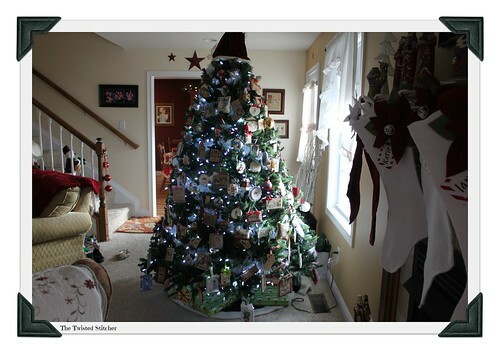 Right there is 6 ornaments (and there are more than that in the design...) all you have to do is use your creative eye and you can see all the different possibilities! That's SEVEN ornaments from one design! It's like a game! ;) and I bet you have TONS of designs in your stash that you can use this technique on. The only thing you need is your design that you want to use, some time to pull out the motifs you want to stitch and a stitch calculator such as this one that I use: STITCH CALCULATOR to determine what count fabric you want to stitch it on to make the size appropriate for your very own "Sampler Tree"! 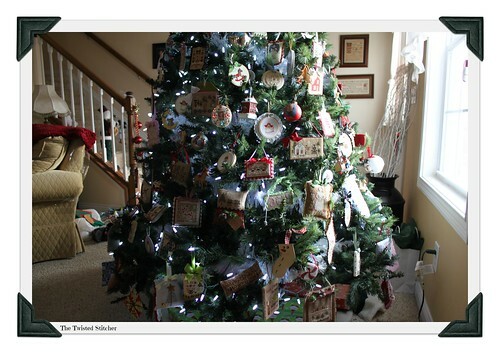 I like my ornaments to sort of be various sizes and shapes, I believe that adds visual interest to a tree that you are viewing. But that is all up to you! I like a mix of pillow and flat ornaments, but that's up to you too! What do you like? that you can pull motifs from...but let's say you are a big school-girl sampler stitcher. Well guess what?! Those work too for this idea! Like Adam and Eve? 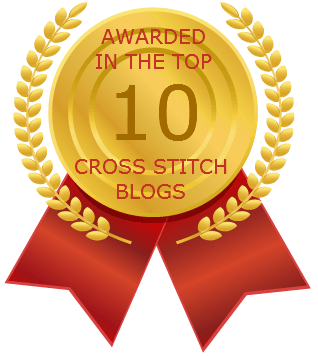 Pull them out of a sampler and stitch them up. 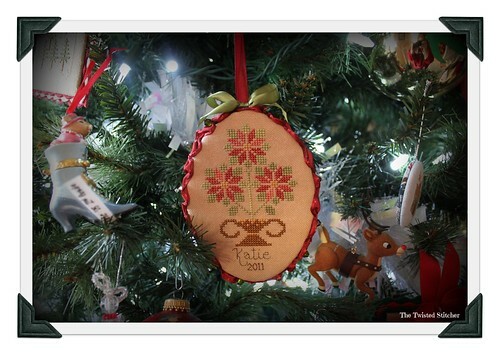 Lots of sweet roses and urns on a sampler you are stitching...HEY there's an ornament! 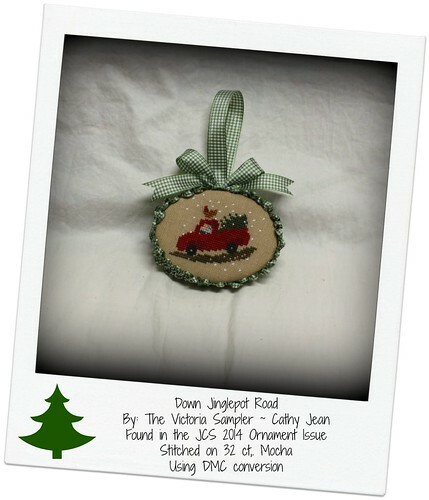 What about that sweet Bessie the cow on the school-girl sampler you're stitching....stitch her with a garland of greenery around her neck for an ornament for your tree. THE POSSIBILITIES ARE ENDLESS! Another Designer that I own a bushel basket of patterns by (and had really good intentions of stitching and HA HA HA! 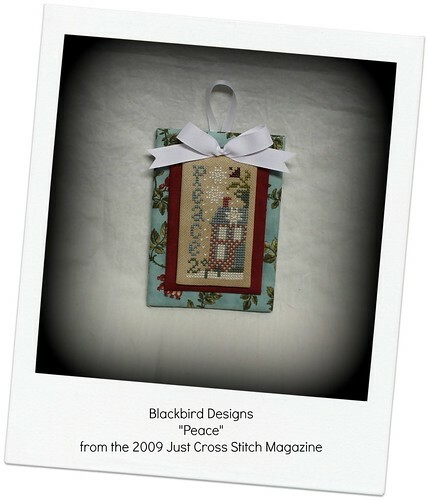 right...) are the Blackbird Designs gals. Think of all the possibilities that these ladies bring to the table for Sampler Tree Ornaments...urns, trees, houses...OMGosh! How about some more designers? No, I don't...you get the idea. 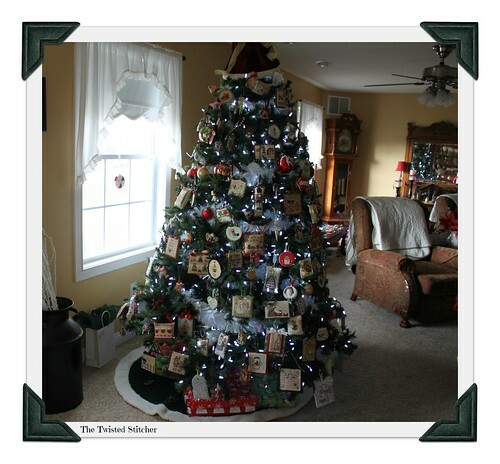 Make 2015 the year of "The Sampler Tree"!! Stitcher's unite! 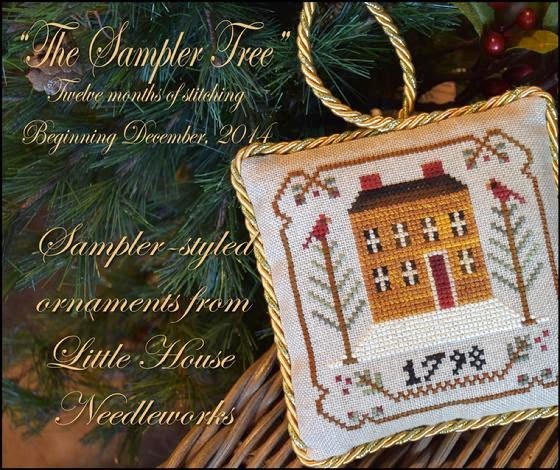 Sign up today at your Local Needlework Shop or your On-Line Stitching source for Diane's gorgeous "The Sampler tree" ornaments! GO GO GO! start pawing through your stash. 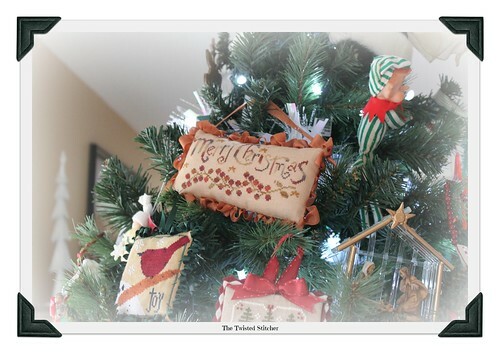 You've got ZILLIONS of Sampler Tree ornaments right at your finger tips waiting, literally waiting to be stitched. Change the colors, change the style...get your creative juices flowing! 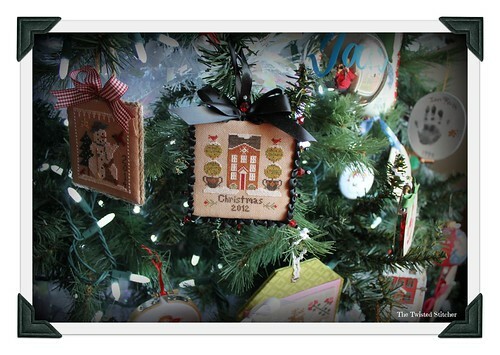 May my dream for Christmas 2015 and the Pfeiffer House Sampler Tree become reality! I'll be keeping my hands to work and heart to God, just like always! 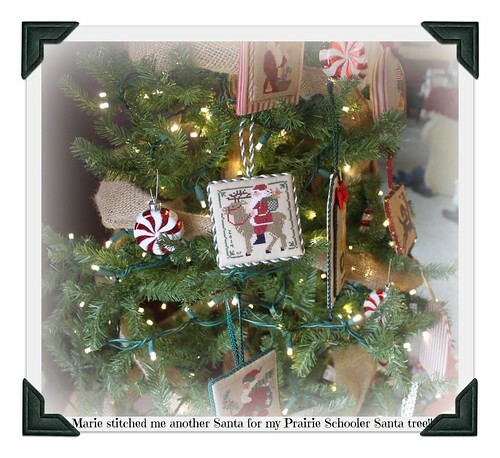 Join me while a dream of my Sampler Tree! Just a quickie post today folks! Last night was a late one due to the Penance Service - but what a wonderful, freeing, cleansing evening it was! :) I'm all pure and white and clean now! I think the green gingham and the oval shape sets it off perfectly! I'll be keeping my hands to work and my heart to God, while I'm chasing my tail all day long! Well this is blowing by....and I'm behind on my final stitching. I have to get done a project in the next three days for my most wonderful friend at work ~ Ann. She's been a true blessing to my life, we've known each other for only 8 years but I love her with all my heart. 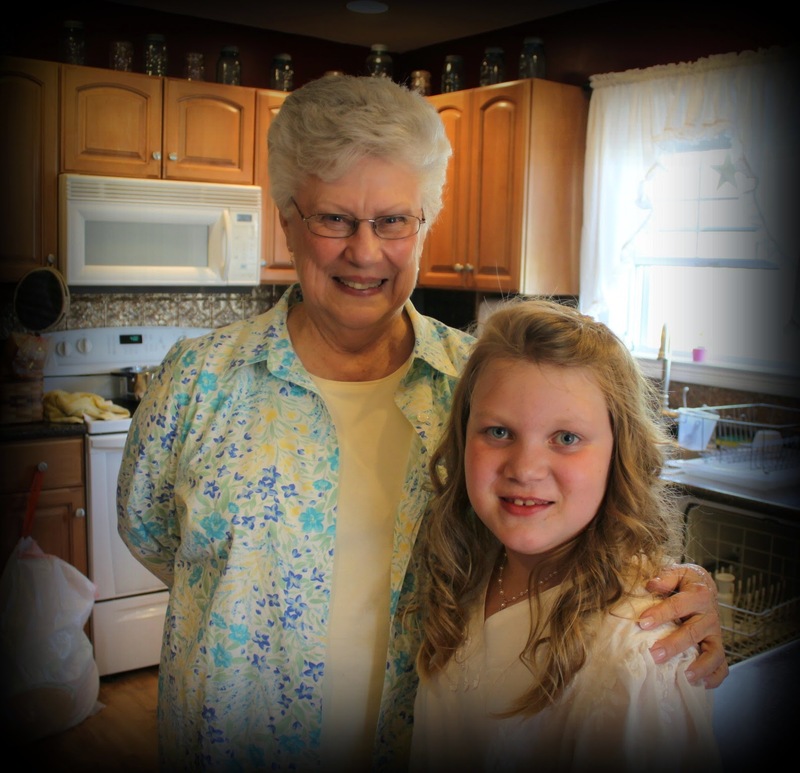 Here she is with Ellie on her First Communion Day, she made the dress for Ellie that she is wearing. 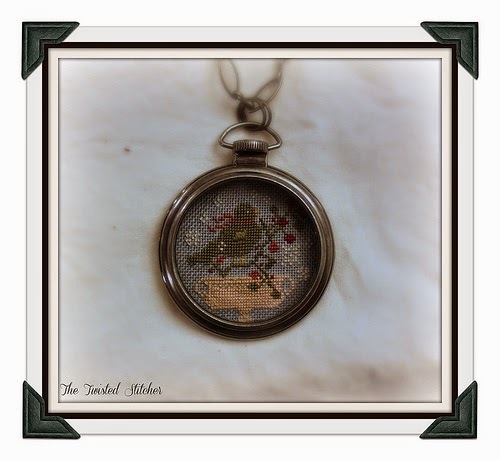 I'm sharing with you an ornament from this years 2014 Just Ornament Cross Stitch Magazine. 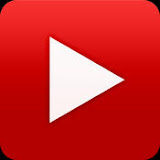 Its been highly popular and has been popping up all over blogland. and added a big rusty jingle bell in the middle. This ornament proclaims something that is very important in my life and in the lives of my little family. Some days I don't know how I would get along without my faith. I'm one of those people that have been blessed from cradle and all through my life with faith. I was blessed to be born into a family that passed on faith and the traditions that go along with the particular religion I prescribe to. I hope that I am doing adequate job at passing on those same traditions and faith that was instilled in me to my own children. I've never once have fallen away in my faith walk ~ but I'm no where close to what a true ideal or model Christian is. But I try awful hard and I hope someday when I'm standing face to face with God, he'll know in my heart, I tried very hard and failed every day but I tried. I'll be cleaning my soul of all my many transgressions and I'll be praying for each one of you ~ known to me and unknown to me ~ for your needs known only by God himself. Today I have a most special thing to share with you! I'm just tickled pink how it turned out! I hope you will be too. 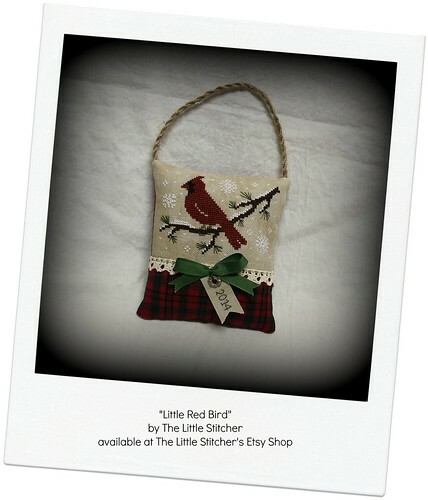 If you follow me and my blog, you will already know that I typically only stitch designs from a handful of designers. Not because I don't like other designers or their wonderful designs, only because I only have so many hours in the day, just like all of you I'm sure! 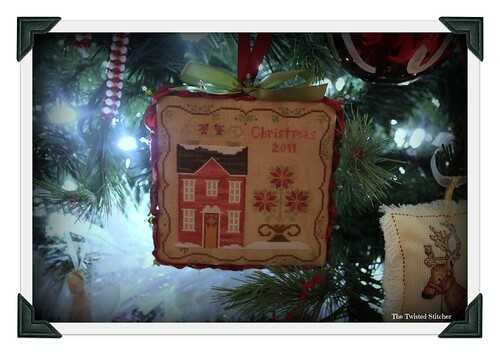 Of course I'm a Christmas Girl and the Just Cross Stitch Ornament Issue will introduce me to designers that I'm drawn to their ornament submission and I will stitch their ornament and then go and look to see if there is something I want to purchase from their design line. That's happened to me a lot! 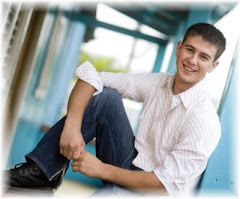 in 2011 I somehow came onto the scent of Brenda Gervais because of her love of the Iowa eagle cam. I was watching the eagles myself and was totally enamored. See I'm a microbiologist and that kind of stuff dings my bell and toots my whistle. Brenda released a limited edition pattern dedicated to the eagles and a portion of the proceeds went to the eagle project. So I bought it and stitched it. And I began to follow Brenda on her blog. I love her work and admire her very much. 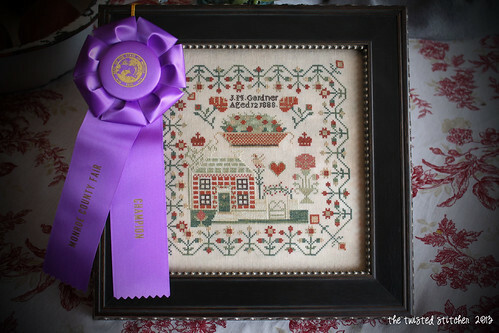 I've stitched many of Brenda's designs. not to like about this cutie patootie? Totally cute as a button. This is ornament size or a little cupboard hanger size. But I've got intentions of stitching it over two on a larger count to make it a little bigger to make a skate for my winter (after Christmas) decor and hang it from a door. I decorate my home seasonally and for winter I do snow and evergreen boughs all over the house and this sweet "A Winter's Skate" would fit right in! I couldn't finish something like that. Have no fear! Brenda includes fabulous finishing instructions. I had ZERO problems making my "A Winter's Skate" in fact it took me like 30 minutes. yesterday's post. I stirred up a cauldron of distress that I didn't mean to do. I received a lot of e-mails and comments from people thinking I was going to quit blogging. NO! 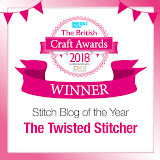 I'm not going to quit blogging...this blog has made me - The Twisted Stitcher. Its sort of like my alter identity now, how can I quit that? Plus, I couldn't just walk away from all the friends I've made. Facebook and Instagram are impersonal, "quickie fixes". I use both venues to connect with friends and to view other's hobbies, etc. But I personally prefer to blog. 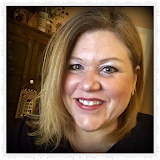 You cannot get that "homey", "warm" feeling by clicking a heart or clicking a thumbs up that you can get from reading a person's heart in their blog posts - so I'm staying. 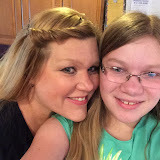 I grieve over those bloggers - for what I am very sure is good reasons - for walking away from blogging and I miss them! 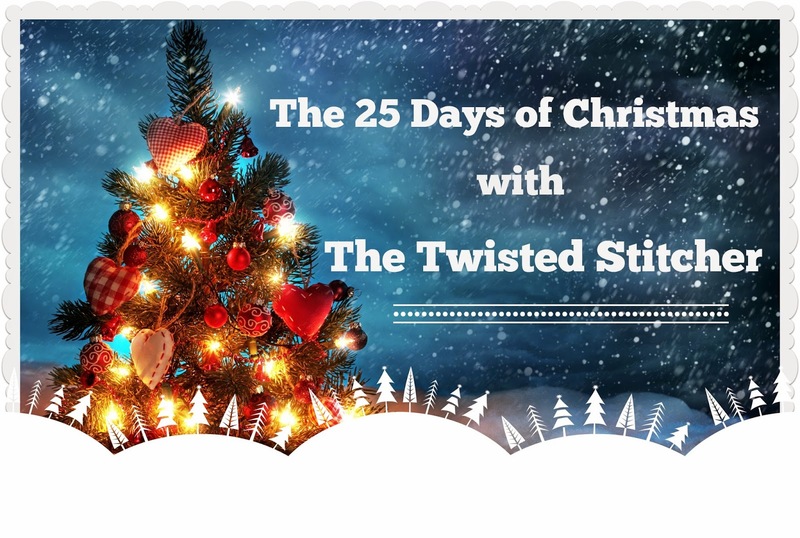 was that maybe I wouldn't do the 25 Days of Christmas with The Twisted Stitcher. I wasn't complaining that it was too much work or that I didn't have time. 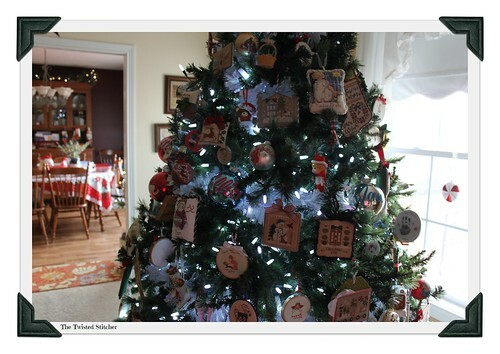 I enjoy it myself because if you haven't figured out by now: I LOVE CHRISTMAS! What my point about not doing it was: I wasn't getting the comments (or responses - many people e-mail me personal comments) that I had gotten last year. 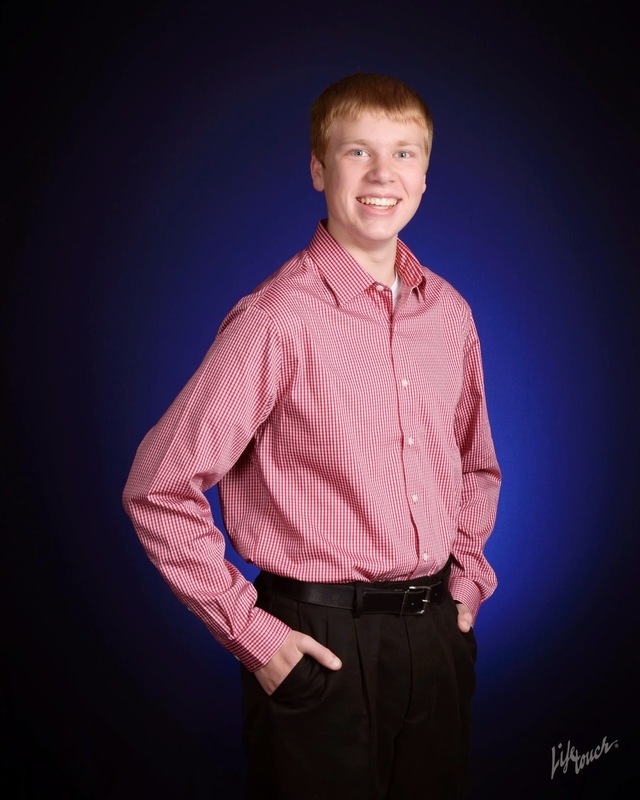 When you put yourself out there (like I do and I do! )...and you don't get a response, a person can't help to think: do they not like what I'm doing? what I'm saying? Am I boring them? Is this too much like last year? I got yesterday, those that read my blog during the 25 days and all through the year, like what I'm doing and what I'm saying. So good! I feel better now! I know everyone is busy and cannot comment every single time. I understand, I'm the same and I'm as guilty as the next guy about skipping commenting sometimes. But I'm aware how it makes an author feel to get a comment and so I try very hard to leave one for the blogs that I follow. It makes a difference.